LBI and the Frankfurt University Library have made significant progress in a joint effort to recreate a landmark collection of Judaica that was long believed to be permanently fragmented by World War II. As of August 2013, about 500 titles from LBI collections that were missing from the Frankfurt Library’s seminal collection of works associated with the Wissenschaft des Judentums (“science of Judaism”) movement had been digitized and virtually reintegrated into the collection. This collection is named for its curator, Aron Freimann, who built the most important Judaica collection in Europe at the Frankfurt City Library between 1898 and 1932. 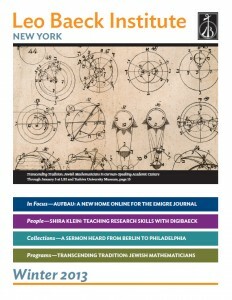 One pillar of the Freimann collection was about 15,000 titles related to the 19th-century Wissenschaft movement, in which Jewish scholars investigated the history and culture of Judaism from a scientific perspective, replacing theological exegesis with the tools of history, archeology, and sociology. 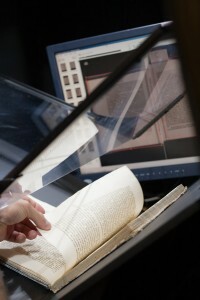 As librarians in Frankfurt began to digitize these holdings, however, they identified about 2,200 missing titles. By cross-referencing its own collections with Freimann’s 1932 catalog, LBI discovered that it had copies of about 1,000 of the missing books, many of them donated by refugees who brought their own scholarly libraries with them when they escaped from Germany to the US in the 1930s. The joint project between LBI, the Center for Jewish History, and the Frankfurt library is funded by an $180,000 grant from the National Endowment for the Humanities and the German Research Foundation. Including the books contributed by LBI, the full text of nearly 8,000 titles from the Freimann collection is already accessible online. When the project is finished, scholars will be able to search, cover to cover, the world’s foremost collection on an influential period of Jewish scholarship as it existed before 1933.